If you really wanted that your computer functioning/ performance could be rated like the movies, TV shows etc. are rated, then this was the feature which would have helped you out. It is basically an index or a number which exactly shows the performance of your computer, its speed while running various softwares and various other parameters concerning the functioning of the operating system on your PC. A subscore is generated for each component, which are Processor, Memory (RAM), Graphics, Gaming Graphics & Primary Hard Disk. The base score is generated as the lowest subscore from any component. A higher base score certainly shows faster and smooth running of your computer than the one with the low base score. WEI(Windows Experience Index) helps you pinpoint the weaker components of your PC and helps you identify them for further up gradation in order to grab a better performance. The Windows Experience Index score ranges from 1.0 to 7.9 . This feature was introduced with Vista and continued up till Windows 8. With windows 8.1 and 10, you need to install 3rd parties to have this feature. You can download two softwares , which are absolutely free in order to have WEI on your Windows 10. 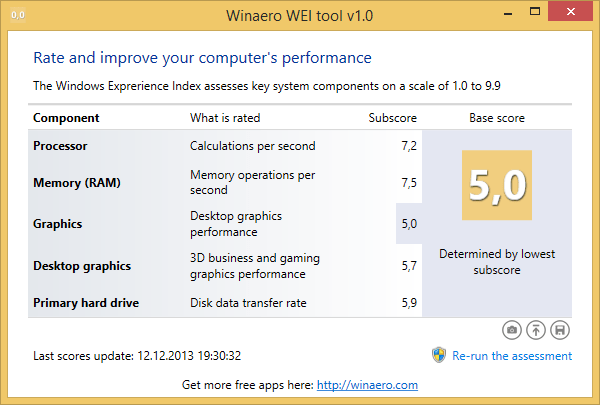 The 2 such softwares are- ChrisPC Win Experience Index & WinAero WEI Tool. This is a free software for non- commercial usage. This software comes up with a wide range of languages- English, German, French, Portuguese, Spanish, Italian, Romanian, Polish & Finnish. In addition to this software, some other softwares of ChrisPC are there, which serve various purposes , whether it is the improvisation of graphics or it’s the managing of the computer’s memory more wisely than before. When you have installed this software, click on “Rate this computer”. Windows System Assessment Tool (WinSAT) will test your PC . The scores will be calculated. Although, on some PCs the ratings will not be shown by WinSAT . Click on More details to see the fault causing failure. You can also re-run your assessments. It can run both on 32 bit as well as 64 bit on Windows 10. You need to have more than 128 MB RAM and approx. 10 MB Hard disk space. This software shows a bit of lagging and while installing, it might add craps to your PC. So, be cautious while it is downloading, or your PC might get infected. The latest version is 1.0.0.1. You can download it as a ZIP file and unzip it to get a .exe file which on opening would directly give you the WEI . It gives almost the same look of the genuine Windows Experience Index of Microsoft. It has also proven to be a better alternative to the ChrisPC Win Experience Index , and it predicts the index accurately. You can also re-run the assessment. Here, you can save your WEI as an HTML file. You can also take the screenshot and save it as a PNG file or upload the image to ImgUr. It is the best WEI freeware tool, which gives you the best & accurate analysis of your computer’s performance, without any lags and craps like other softwares do.This is because it has window’s core components, which really helps it give an accuratge estimate of the Base scores of the computer. In this fast paced world, development is the key to sustainability. More and more softwares are coming. So, there can be still better softwares than what we have for WEI. Do lookout for any, if it comes and get into touch with us.